How about that keyboard reflecting in Ray Charles’s sunglasses? That’s rock and roll, or more specifically, the blues. This legendary scene, from the “Blues Brothers” movie, is and irreplaceable document of blues rock awesomeness. The Blues Brothers were a group formed by Dan Aykroyd and John Belushi, two SNL geniuses who loved the blues and came up with this brilliant concept for a Chicago based blues group. The dark suits, hats, and shades are icons of TV and movie magic. It’s just another example of the insane role that the likes of Aykroyd and Belushi were on in the late 70s/early 80s when it came to dominating the coolest ideas of global comedy. 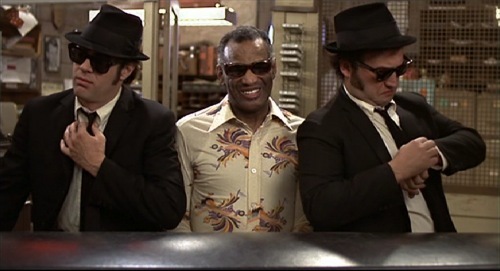 The original Blues Brothers band consists mostly of the first SNL band, and they really cook. It’s a reminder of how huge SNL was in the late 70s that even the band members got starring roles in a blockbuster feature film. The movie, directed by hot 80s director John Landis, is a crazy car crashing romp of great music and fantastic dance sequences, evidenced below. Check it out. DK on The X-Men TAS Podcast: Episode 56 – Beyond Good and Evil Part II + Avengers Infinity WAR!!! Copyright © 2003-2010. All rights reserved. Theme: Black-Letterhead. Powered by WordPress v 5.0. Page in 0.459 seconds.